If you don’t already own one stop what you are doing right now and order yourself a spiralizer. Seriously, it will be the best $30 you spend all year. Follow the link in the bold print above and it will take you to my favorite model. I use mine all of the time and it’s a fun way to eat your veggies. Taylor and I are partial to turnip and sweet potato noodles because they stand up well to hearty sauces like tomato/meat sauces, curries or cream based sauces. In the past I’ve used zucchini noodles but they tend to get watery if you add a lot of sauce to them. Luckily, it’s winter and turnips and sweet potatoes are in abundance! This simple dish is packed full of flavor and the sweet potato noodles are the star. With the addition of fried chickpeas and a creamy/spicy cashew sauce this turns into a complete meal. Grab a fork, pour a glass of wine and dig in! Prepare the sauce by combining all the ingredients in a small blender or food processor and process until completely smooth and creamy. Taste for seasonings and adjust as needed. Prepare the chickpeas by combining the paprika and cayenne in a small bowl and set it aside. Heat the oil in a large skillet over medium high heat. Add the chickpeas to the skillet and sauté until golden and crisp, about 15 minutes. Shake the pan often while cooking. Using a slotted spoon transfer the chickpeas to a paper towel lined plated to drain. Place the chickpeas in a bowl and sprinkle with the paprika/cayenne mixture, salt and lime zest. Mix until well coated. Using a spiralizer (or julienne peeler) make long thin noodles with the sweet potato. If some noodles are too long use kitchen scissors to cut them in half. Heat 1 tablespoon of olive oil in a large skillet over medium-high heat. Add the noodles and cook, stirring occasionally, until tender crisp, about 5-8 minutes. Remove from the pan and place the sweet potato noodles in a large bowl. Drizzle with enough of the sauce to evenly coat the noodles, adding more sauce as needed. 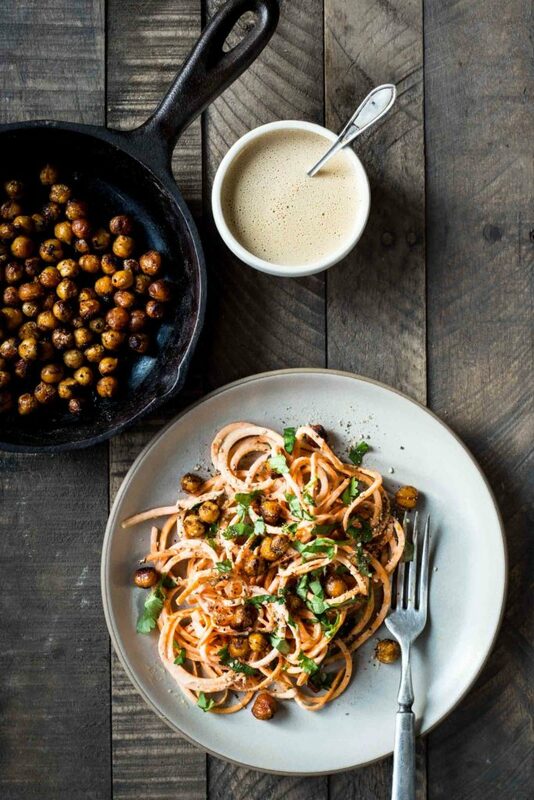 Divide the noodles between bowls and garnish with fried chickpeas, cilantro and sesame seeds. I can’t wait to make this! I love the new website, by the way, it’s gorgeous. In the old format when I would print a recipe, the photo was part of it. Now, the recipes print without the photo. Since your photos are so gorgeous, is there a way to add those back in? Pretty please? “core” of whatever I have spiraled sliced up in the recipes, also. I agree with Dawn: The photos are an important part of your recipes and I, too, would like them added back 😉 Thanks ! Have made this 4 or 5 times and it is “THE BOMB” my hubby loves it, my daughter lives it, I love it. Any other recipes like it? I have followed your site for a long time and many of your recipes are staples in my weekly meals. Thank you!